Thanks to your generosity we collected $15 in 'Happy Bucks' and 'Dollars for the Foundation' last week. All these contributions benefit the Rotary International Foundation. Our club enjoyed having Jeff Jennings join us for breakfast last week. Jeff is a member of the Rotary Club of Shawnee, a leader in the community and a champion of the On the Road club project. Also, I’m attending a noon meeting today with virtually all the other Clubs’ Presidents and or President Elects. The purpose is to foster ideas for a community-wide project that will put ROTARY on the Kansas City Map. When we Johnson County Rotarians worked at brainstorming a few weeks ago, we produced 76 ideas - both funny and serious. For the last two “Rotary Minutes” we have discussed crazy ideas and the best fundraisers we could remember. This week we’ll review the best ideas for bringing in new members. Our most effective recruiting happens when we invite people to help us with our big projects. We gained quite a few members with the Valentine Rose fundraisers when friends either helped with the prep or with the fun process of delivery. Projects with Heart to Heart that put together disaster kits for personal health or medical needs brought some interest. 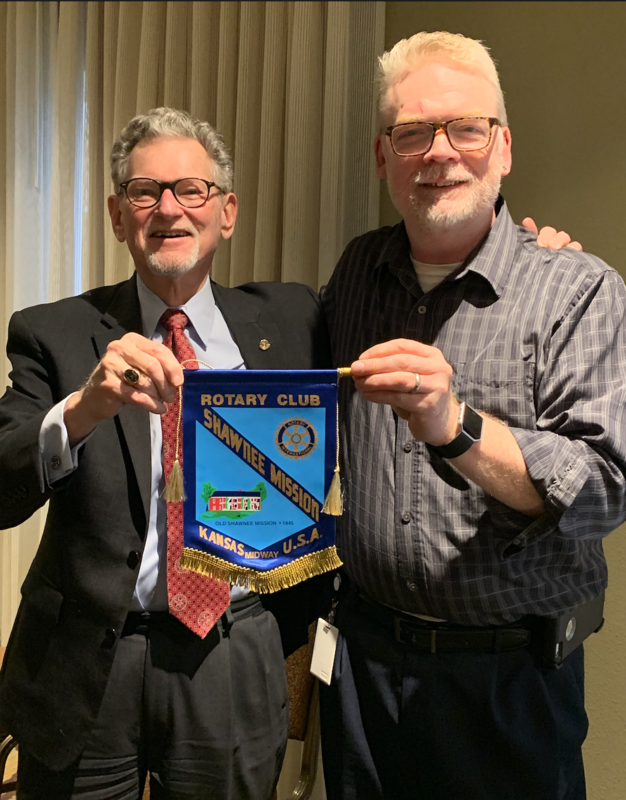 The joint Polio-Plus project with two or three other Rotary clubs may have gained us a couple of folks. Our Top Golf project got us some prospects. Our brainstormers said we should do more to incorporate our membership campaign with our major fund-raisers. Where are all the connections that we make with Oktoberfest? There must be dozens of names we have gotten through our raffle and ticket sales, not to mention the business people who donate auction items. One group suggested that we organize small membership events and invite friends - maybe a happy-hour event, an evening fireplace gathering or a weekend coffee klatch. These mixers might be fun. Another idea is to do more ‘community service’ events to get us in the public eye. President Joe is working on a joint project with other clubs at this very moment. However, the most successful way to gain members is for Rotary members to invite people they know to club meetings and then follow it up. Yes, it’s that personal “ask” to someone you know that works the best.